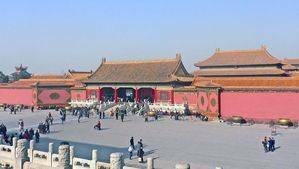 The inner courtyard is the area of the Forbidden City reserved for the personal use of the Emperor. It was obviously a highly protected place, the most important part of the palace tied with the outdoor courtyard, which was the workplace of the emperor. This courtyard is oddly small enough. It is placed approximately in the center of the palace, a little to the North, and adjoins the western and eastern outbuildings. North of the inner courtyard is the imperial garden, the last limit of the palace with the gate of divine prowess marking the exit. The emperor was in fact "prisoner" of the palace, he could not leave, except with very few exceptions. This area was the one in which he was most frequently. 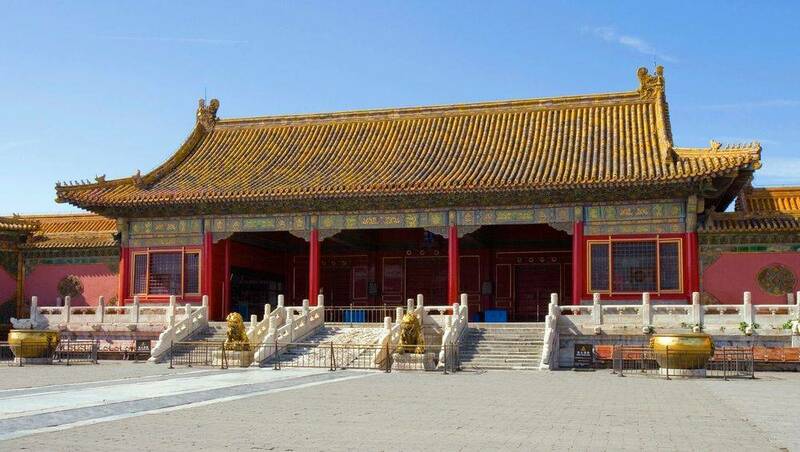 It is circumscribed by a high wall, as usual in the red forbidden city and richly decorated with yellow tiles (color of the emperor), and contains essentially the private palace of the monarch, a succession of 3 pavilions: the Palace of the heavenly purity (his bedroom), the pavilion of union and peace and the palace of earthly tranquility (the room of the empress). Part of the pavilions of the inner courtyard were rebuilt in 1605, 200 years after their construction (1420), following two successive fires. 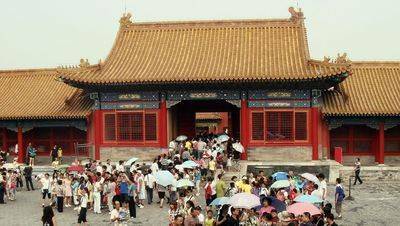 The fires were - and still are - one of the highest risks for the Forbidden City. The inner courtyard is interesting for its 3 main pavilions, testimonies of the glorious past of China. 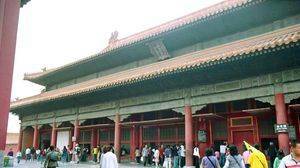 But we must not forget that the forbidden city nowadays is a museum. The pavilions allow visitors to discover 18th and 19th century automata that were part of the imperial collections. Most are of European manufacture. One can also see at the entrance, that is right in front of the door of celestial purity, two bronze lions (charged with forbidding women to enter the outer court, where the politics of the country were played out) , and two tanks of fire water, also in bronze. 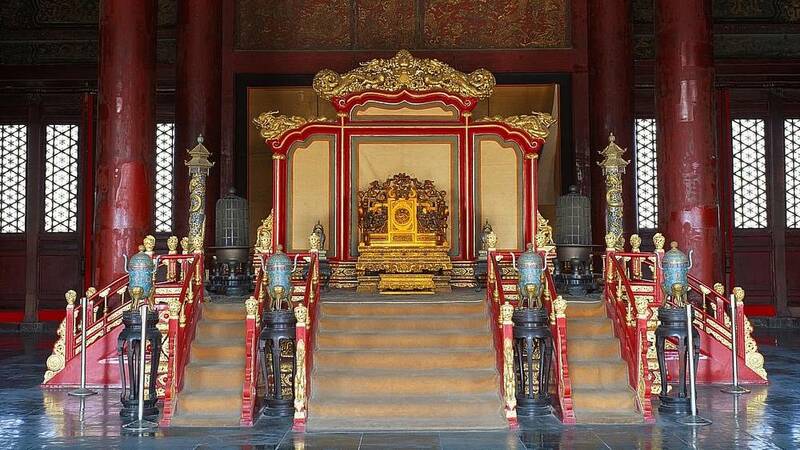 The centerpiece of the inner courtyard is the beautiful imperial throne, in the palace of earthly purity. It is accompanied in the hall of union and peace, royal seals in jade, 26 beautiful pieces that were controlled by the Empress, and a beautiful 3-storey carillon. 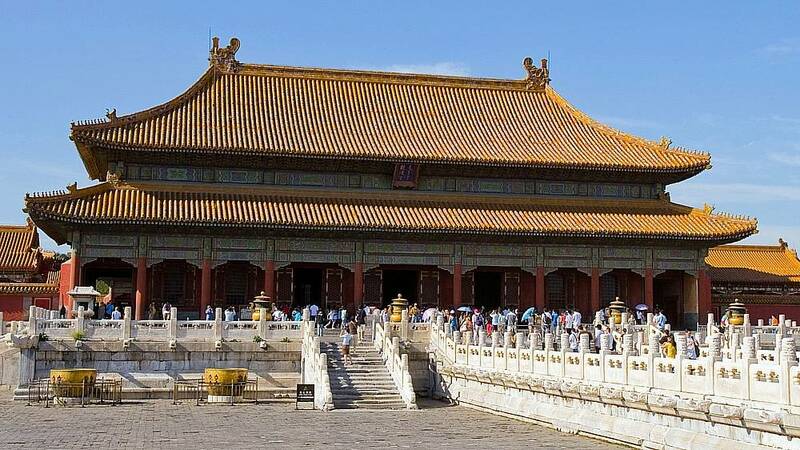 The Gate of Heavenly Purity, called in Chinese Qianqingmen, is on the central North-South axis that divides the Forbidden City into two equal parts, but it is also the gateway separating the outer courtyard from the inner courtyard. It serves as the main entrance to the private estate of the emperor. 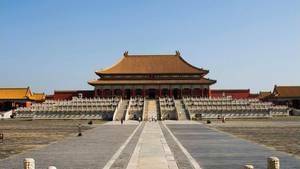 It dates from the construction of the Forbidden City, between 1407 and 1420, and was rebuilt in 1655. It has arcades surrounding it, as for other pavilions. There are 5 on the length and 3 on the width, the gate being 16 meters high. It has a unique roof and rests on a white marble base 1.5 meters high surrounded by a carved stone balustrade. At the entrance of this gate the visitor can see two magnificent bronze lions, as there are sometimes in other pavilions. These are a little different, they have piercing eyes and ears folded. 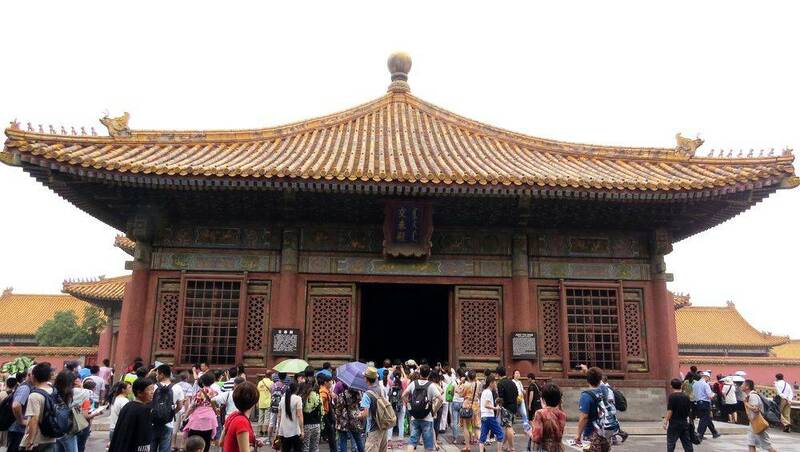 Settled under the Qinq (1644-1912) dynasty, their role was to prevent women from entering the outer court (where state affairs were forbidden for women) and courtiers to enter the inner courtyard (which was the private domain of the Emperor). 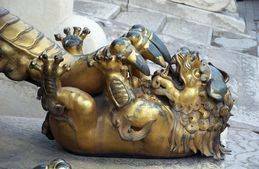 They were a little Cerbers of the Forbidden City. Beside the door there are also two very large bronze vats, very bright. Although decorative, their primary function was to contain as much water as possible to cope with a possible fire. Each of these tanks weighs four tons and contains more than two hundred liters of water. Of the three hundred and eight vats distributed in the Forbidden City, twenty-two are of the same design as these. In 1644, the first emperor of the Qing Dynasty, Emperor Shunzhi (1644-1661), decided that this door would be unused, but the following emperors rehabilitated it by making it a kind of high reception hall. officials and ministers of state. The latter had to arrive at dawn and kneel while waiting for the Emperor who received them on a temporary throne. He listened to them successively in a very specific order: Heads of the boards of directors of the revenues, the rites, the war, the works and the civil bureau. The decisions were of course taken by the emperor and by him alone. Emperor Kangxi, one of the most effective of the Qing dynasty, ruled for 61 years (1662-1722). It is in this room that he made many important decisions. However, after the reign of Xianfeng (1851-1861), the Gate of Heavenly purity was no longer used. Behind the door of Heavenly Purity (Qianqingmen) opens a smaller yard, at least compared to those in the outer courtyard. The main element of this courtyard is the Pavilion of Heavenly Purity, also called "Palace of Heavenly Purity" (Qianqinggong in Chinese). 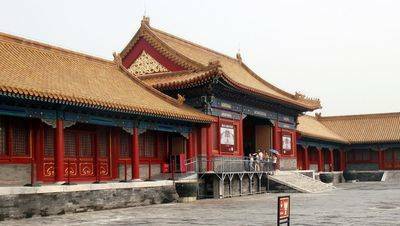 It was simply the room of the emperors of the Forbidden City, at least until the emperor Yong zheng, in the Qing dynasty. Afterwards, it served as a study or courtroom. It is the first of three pavilions of the inner courtyard. This is a smaller version of the Supreme Harmony Pavilion, also lower, to mark the difference with him. 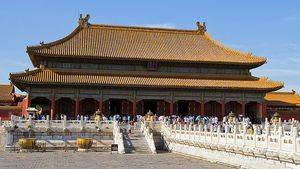 It is however the largest of all the pavilions of the Forbidden City. It was built in 1420 and rebuilt in 1798 following a fire. This pavilion was also used for reading official documents, their signatures as well as for the reception of ministers and other senior officials. Sometimes banquets and even ceremonies were organized. Twice (in 1722 and 1785) there was a "Banquet for a thousand old people". The guests were old people from more than 60 countries. Emperor Qianlong even gave them gifts. 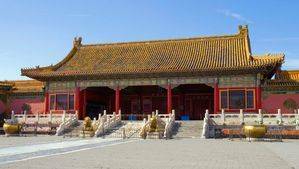 Later, Emperor Yongzheng moved his living quarters to the Temple of Food of the Spirit, which is located to the west, but this pavilion still retained a great role in the imperial life. In addition, under the Qing Dynasty, no matter where the Emperor died, his coffin was always placed in this pavilion for a few days during commemorative ceremonies. Once these ceremonies are over, the coffin is moved to Jinshan and buried in the mausoleum. The palace has on its right and left two small, simpler pavilions. 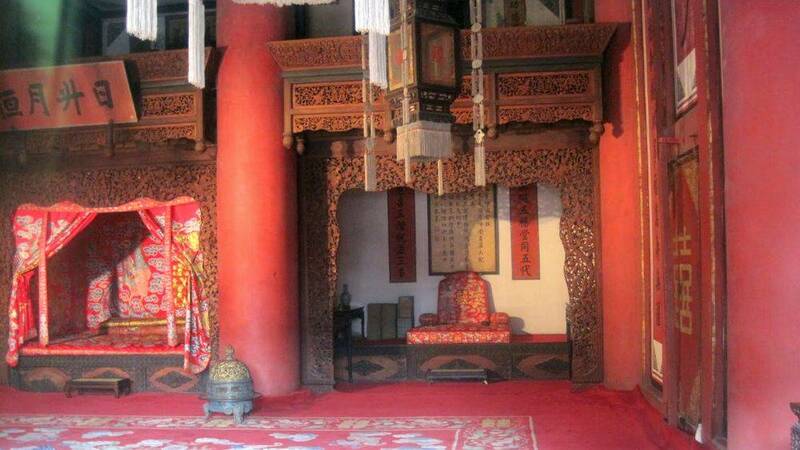 The one on the left is named Hongdedian, it was used as antechamber for the notables to meet the emperor (under the Ming dynasty) or as imperial office (under the Qing dynasty). The one on the right, Zhaorendian, served as a warehouse for books (a kind of library), and later class for the emperor. 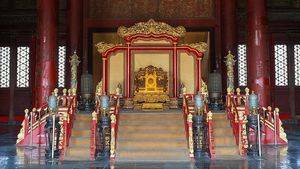 The room has a throne, arranged on a platform, surrounded by incense burners, long red candles and large mirrors that have been placed next to the throne to ward off evil spirits. On the columns all around, there are two pairs of verses written by the Qing emperors. On the throne hangs a plaque engraved with four Chinese characters, written by Emperor Yongzheng and which means "justice and brightness". From the time of Emperor Yongzheng, the name of each Crown Prince was written on duplicate documents and a copy was placed in a box behind this plaque. The other copy was kept by the emperor. The prince designated by these two copies had then the legitimacy of the succession of his father. If, unfortunately, one of the two copies did not conform to the other, the prince must be disavowed. The courtyard of the palace is also surrounded by high walls. 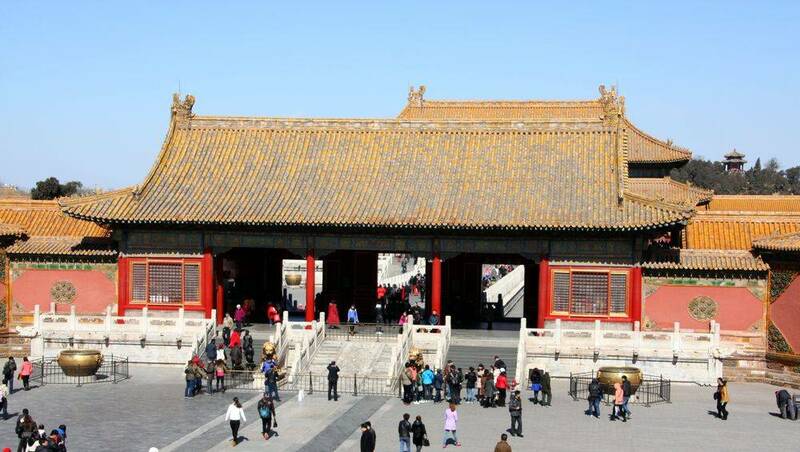 It is closed to the south by the Heavenly Purity Gate, and on the west and east sides are two small doors, named Yuehua and Rixing. This palace did not always have the same face, in fact it was, initially, relatively different from the one we know today. The renovations took place in 1798, transforming this palace from the old version into its present form. Built from the beginning of the Forbidden City in 1420, during the Ming Dynasty, this pavilion was rebuilt in 1655, in 1669 and renovated in 1798 following a fire. It is the only building in the Forbidden City to have a roof ending centrally with a ball-shaped decor. It is square, 3 arches side, so small enough. This is the second pavilion of the inner courtyard, between the two others. It is similar in style to the central harmony pavilion in the outer courtyard. Under the reign of Emperor Shunzi (1644-1661) the power was very weak. The eunuchs took the opportunity to improve their dailies by intermingling, among other things, the affairs of the state. In the face of this de facto takeover, the emperor ordered that an iron sign be placed prohibiting the interference of the eunuchs in the affairs of the government. Under the Qing Dynasty, the Empress held ceremonies in this pavilion for various occasions, such as her birthday. On the occasion of the winter solstice and the Spring Festival, the notables came here to pay their respects to the empress. In 1748, during the reign of Qianlong (1736-1795), the emperor put into circulation twenty-five "bao" (royal seals in jade). 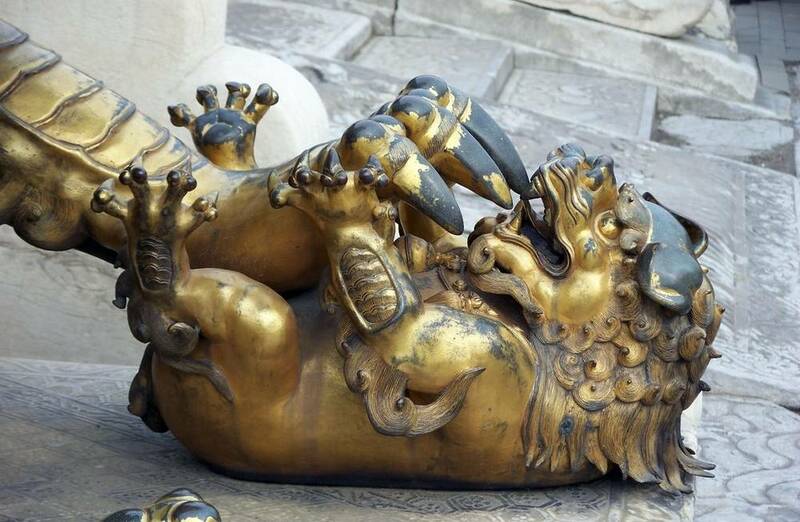 Each could be used for the exercise of power in the Forbidden City. The royal seals were under the empress's control in the Union and Peace Pavilion and could only be used if she had given permission. They were stored here. Some specialized summer: the seal named "huangdizhibao" was used for the promulgation of the list of admitted to the jinshi (third degree existing at the time). The "Zhifazhibao" and "mingdezhibao" served the emperor to command and honor his vassals. The "zhiyuliushizhibao" for military affairs. The royal seals were put in delicate boxes covered with yellow damask silk. These boxes are still located in their places of origin in this room of the Palace Museum. The carillon of the big clock was made in 1798, the third year of the reign of Jiaqing (1796-1820). The structure is a wooden tank imitating the style of a Chinese pavilion. With a total height of 5.80 meters, the clock has three levels. At the back of the clock there is a staircase, through which the staff could put it back. The clock chime has run for over two centuries, but the chime sound is still as clear and loud as ever. More than three thousand years ago, the Chinese people invented a method for measuring time with drops of water. The bronze clepsydra exposed here was made in 1745 and it is the only one kept in such good condition. Called in Chinese Kunninggong, it is the third and last of the inner court palaces, erected behind the hall of mighty fertility. 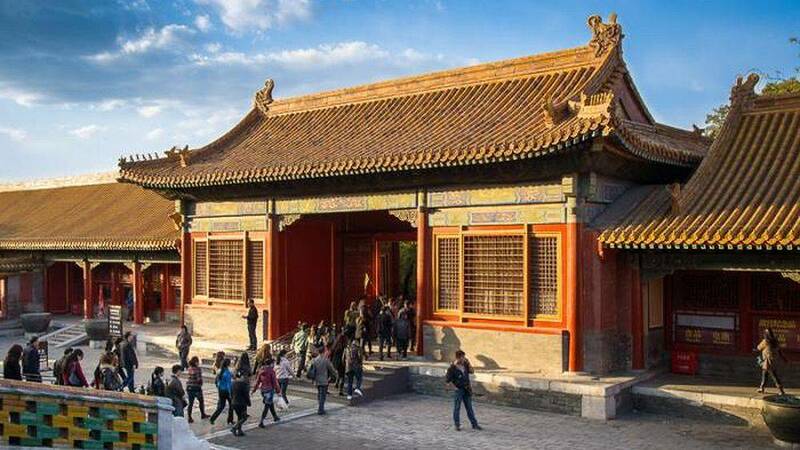 It was built in 1420 as the rest of the Forbidden City and was rebuilt in 1605 due to two fires in 1514 and 1596 respectively. A few years later, it underwent three other restoration works. Facing south, it measures 9 arches long and 3 wide. 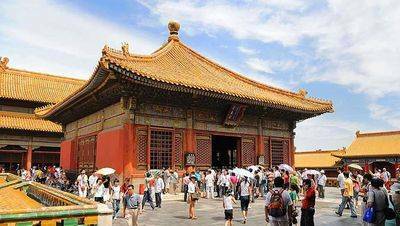 It has a height of 22 meters, and a double roof with secondary buildings, just like the Palace of Heavenly Purity, but in smaller ones. It has the originality of having its opening on the side and not on the facade, it is simply that at the time of its reconstruction the emperor was Manchu, and it is a Manchu habit to have the doors of the buildings on the side. His role is clear: In the Ming, he was the residence of the Empress. Under the Qinq, and especially under the reign of Shun Zhi (1655) was divided into two: A relatively small part was the bridal chamber, the other part was a temple dedicated to the home gods. The Great Hall in the West was used for sacrifices, offered to the gods of the home of course. The bridal chamber is all red, floor to ceiling. It is decorated with a large number of characters "double xi", which means "double happiness". The bed, very large, occupies a quarter of the floor area of the room. After the marriage the emperor and the new empress spent three days locked up in this room for their "wedding night". Then they separated to live on their own. As far as sacrifices are concerned, it should be known that the Qing, of Manchu origin, were very religious. When they came to power in China, they kept their beliefs while adopting other Chinese ones. Thus the four lateral chambers of the palace of earthly tranquility hosted an altar for sacrifices to divinities. The third room, to the east, was pierced by two doors facing each other, inside which three pots were used to cook the meat. The sacrifices were made twice a day, one in the morning and the other in the evening. The two secondary rooms to the east were the bridal suite for the emperor and empress. The wall of the room was painted red and the palace lamps were hung with Chinese characters meaning "double happiness" to create a warm and cheerful atmosphere. In front of the door there is also a small text encouraging happiness, so every time the Emperor opened the door he saw this text. The delicate and exquisite canopy bed is embellished with an embroidered duvet with 100 children playing, hence the name "100 Canopy Kids" and "100 Kids Quilt". This piece was used only if the emperor was already in office, which limits to three the number of those who were not entitled to it: Kangxi (1662-1722), Tongzhi (1862-1874), and Guangxu ( 1875-1908). In fact, the weddings of the emperors were extremely luxurious. The wedding of Emperor Tongzhi cost 11,000,000 taels of silver, while that of Guangxu cost 5.5 million taels of money despite the extreme poverty of the country at that time. This palace was completed by two annexes, one on the right and the other on the left. The one on the right is named Dongnuan, the other Xinuan. The gate of the Terrestrial Tranquility is simply the gateway to the palace that bears the same name. If usually such a door opens on a courtyard having the palace in its center, here the door is very close to the palace, one can thus say that the court is very small. As a reminder, a door at the Forbidden City is simply a pavilion that must be crossed to cross a thick wall and high. It is also a place to live or work. Clearly, it's big and functional! This door opens to the North on the Imperial Garden, a very wooded area. 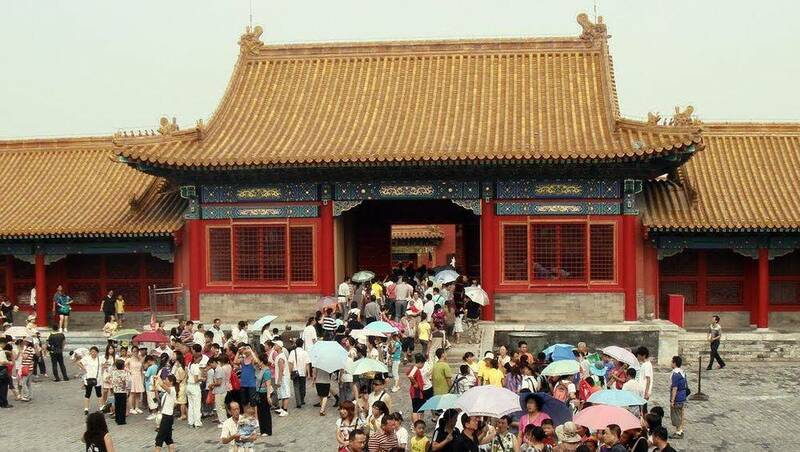 The gate to the lunar essence is on the west wall of the inner courtyard, it overlooks the western palaces. The door of the solar essence is on the east wall of the inner courtyard, it overlooks the eastern palaces. This is a real door, ie a hole in a wall to pass. 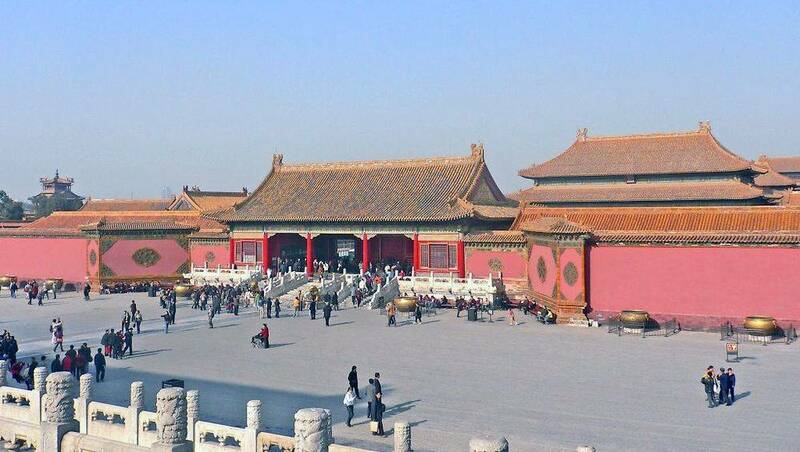 Most of the gates of the Forbidden City are actually buildings that can be crossed. The gate of flourishing blessings is on the west wall of the inner courtyard, it overlooks the western palaces. It is a fairly simple door, a building about 10m long, with a single door and a window on either side of this door. The decorations are of quality, as often. 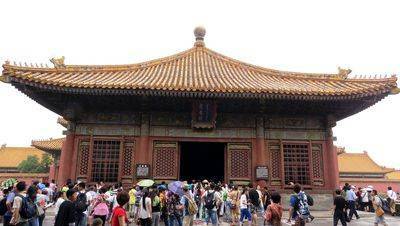 The door of the auspicious harmony is on the east wall of the inner courtyard, it overlooks the eastern palaces. It is quite simple when compared with others, it is built on a small terrace and has a modest size room accessible via porches. She has two fire prevention jars right in front.